Please scroll through the photos above to see more pictures from the event. HUNTSVILLE, Ala. (February 4, 2019) – U.S. 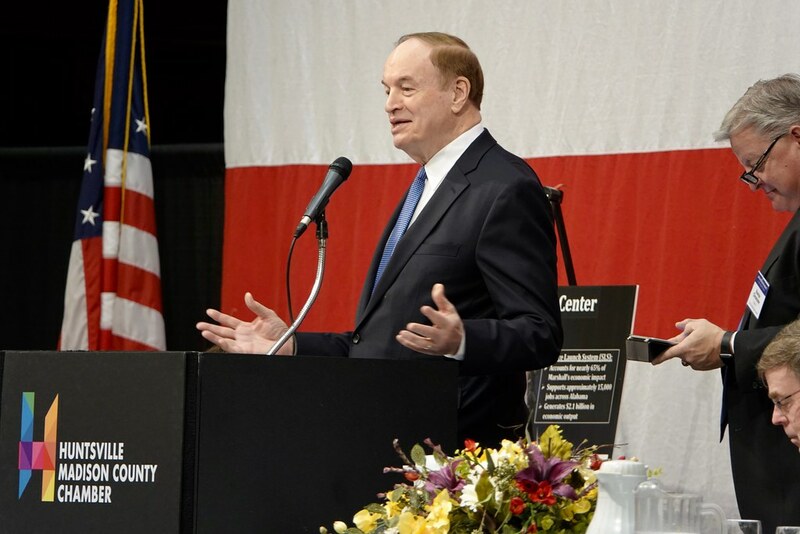 Senator Richard Shelby gave his annual address to members of the Huntsville/Madison County Chamber on Monday, first hitting the topic that was on everyone’s minds — the recent partial government shutdown, and the impending February 15 deadline which could mean another similar situation. “Nobody wins in a shutdown, not the President, not the Speaker, and who really loses is the American people,” said Sen. Shelby. Sen. Shelby is part of a 17-person bipartisan conference committee tasked with creating a deal on border security and President Donald Trump’s proposed border wall. Later this week, the committee will hear from Customs and Border Patrol experts to learn what they believe is needed along the Southern border. “What I’m trying to do is get to yes. To fund the government, to move on to other things,” he added. Sen. Shelby discussed the new $110 million federal courthouse coming. No timeline has been announced, but he said construction could start in the next year. It will be built on five acres the city purchased at the corner of Gallatin Street and Lowe Avenue.